Our classic Bubble Bead Filter offers robust, efficient, and dependable water filtration. 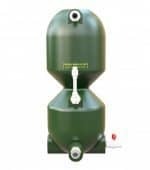 Bubble Bead filter Bioclarifier – Bubble Bead Filters by AST offer easy maintenance and effective filtration. AST’s Bead filters capture 100% of particles greater than 50 microns and 48% of particles in the 5-10 micron range per pass. In addition to solids removal, these filters provide biological filtration, breaking down the nitrogenous wastes into non-toxic substances. Our gentle backwash removes the collected solids while keeping the necessary bio-film intact. How Does Bubble Bead Technology Work? Bubble differs from the Propeller Bead® and Polygeyser® bead filters in its simpler, yet very effective gentle backwash. The backwash is started by shutting off the circulation pump and opening the sludge valve. As the water drains from the filter, a check valve on the effluent line closes, creating negative pressure in the filter. The potential energy of the water leaving the filter pulls air in through the air inlet. The results in the backwash expanding and agitating the bead media in a vigorous boiling type action as it passes downward through our unique washing throat. As the beads enter the lower expansion chamber, the downward velocity decreases due to the increased cross sectional area so the beads are suspended as the water washes the solids away from the beads and out of the filter. Once the flow of the wastewater stops, the backwash is complete. Simply close the sludge valve and turn the circulation pump back on. Your filter is now in normal operation with a clean filtration bed. The Bubble Bead® backwash is vigorous enough to remove unwanted solids and debris, yet gentle enough maintain a healthy bio-film on the bead Media. In fact, during testing the nitrification rate actually increased with increased backwash frequency.